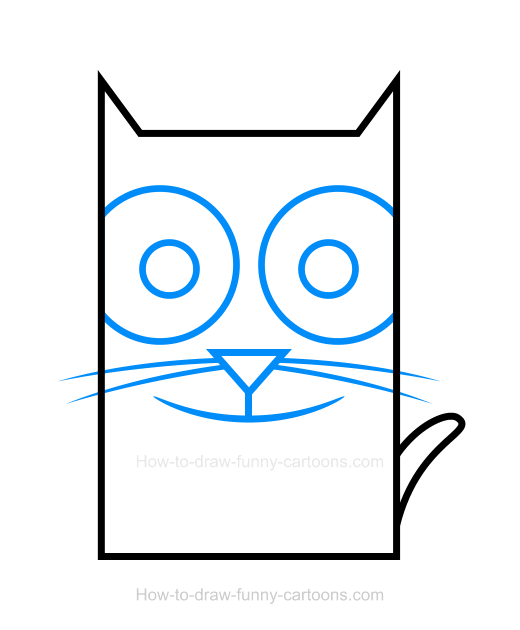 Using only four basic steps, draw a cat clipart like the one below using mostly simple shapes and plain colors. No doubt that cats are quite popular these days. You can see them everywhere, even in Facebook feeds, Youtube or any other social medias. 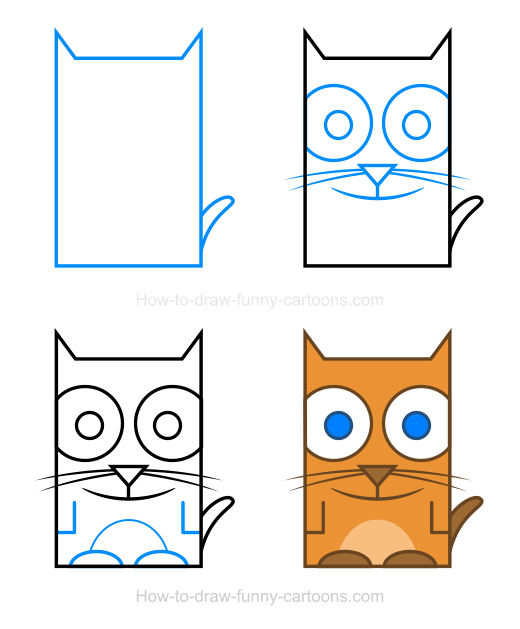 You can start this lesson by sketching a large rectangle to illustrate the head and the body of the cat. Then, you can draw two small triangles on top of the head to form the ears. All these shapes can be merged together to create a single one. 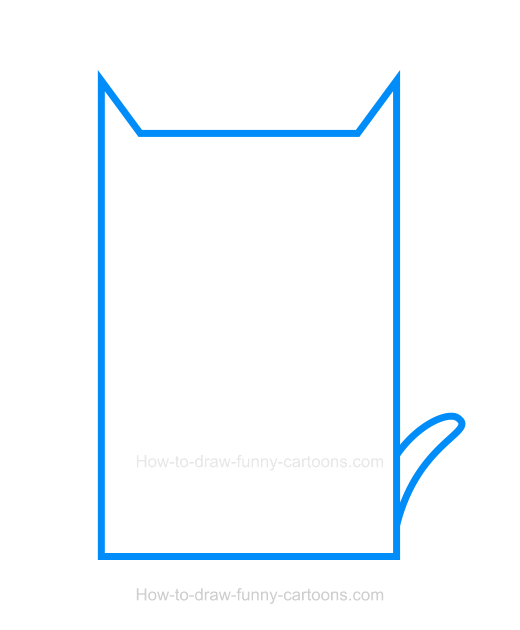 Finally, draw the tail using curved lines like shown in the illustration below. Next, you can work on the facial features of the cat. Draw the eyes and the pupils using circles. Notice how the eyes are partially hidden on both sides of the rectangle. A small triangle can be used to illustrate the nose. Long pointed lines are sketch to create the whiskers. Finally, the mouth is done with a long curved line. Now that the head is done, let's create the back legs using curved lines. The little arms on top are made from straight lines. 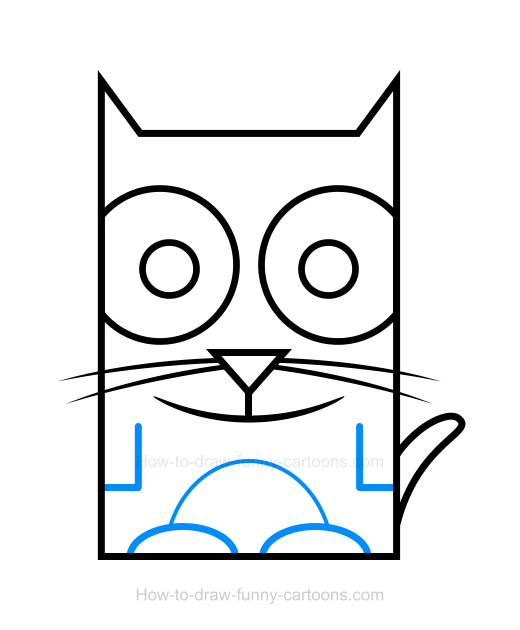 A large patch made from a long curved line is also added on the stomach of the cat clipart. Let's add plain colors to give life to this nice cartoon illustration. In this case, I have selected a nice orange color instead of grey or black. The pupils are filled with a bright blue color while the nose, the back legs and tail are slightly darker. Great work! We are done! 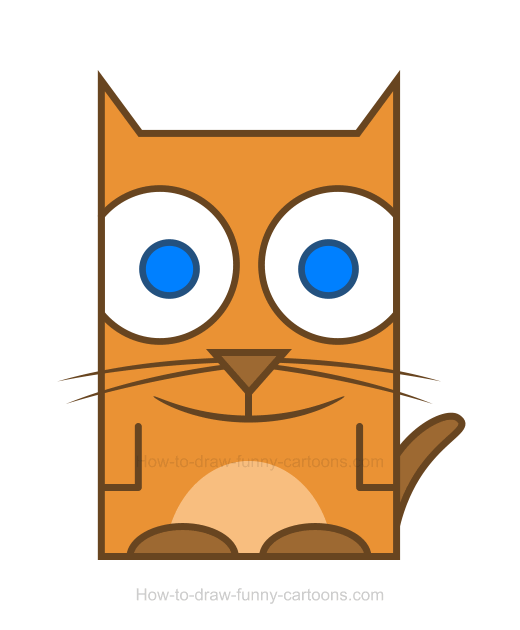 Nice work creating an adorable cat clipart! These are all steps that must be done to create a fun and adorable cartoon cat like the one found below. Take your time, practice as often as needed and creating this animal should be an easy task.